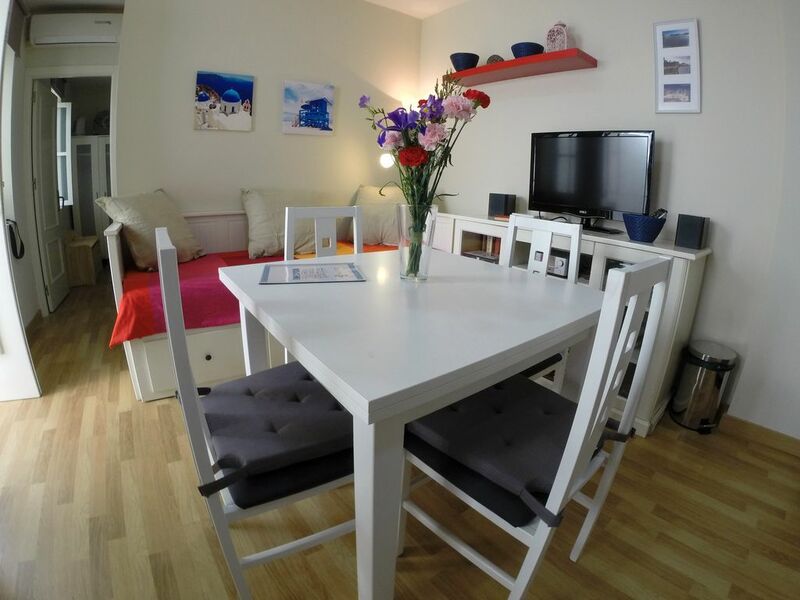 This beautiful apartment in the old town of Cadiz capital, has a room with double bed and wardrobe, living room with dining table and a comfortable sofa bed for two people, modern bathroom and fully equipped kitchen. free Internet access and air conditioning is available. Located in the historic center of Cadiz, this beautiful apartment on the 2nd floor without elevator has capacity for 4 people max. Recently renovated, the house retains all the charm of a three millennium old city, next to the famous Torre Tavira. Upon entering the house there is access to a bright and sunny, with its wooden windows and white marble floor features central courtyard. This beautiful apartment has a cozy living room with dining table and sofa bed. The bedroom has a double bed and a wardrobe. The kitchen is fully integrated and equipped with cooker, refrigerator, electric water heater, coffee maker and all necessary cooking utensils. It offers free Internet access and air conditioning. The dishwasher is complete with a modern bathroom with sink, shower and toilet. very nice apartment, and everything in perfect working order. ideally situated too. we really enjoyed cadiz, a beautiful city. lots to do & see and we intend to visit again soon. perfect place to combine city/beach holiday. Never had to wait for someone to show. The apartment is less than two blocks from everything from a big mercado to good coffee shops. The apartment is clean and comfortable. Thanks. El apartamento está muy bien situado, cerca de todo pero el apartamento es un segundo sin ascensor, con escalones muy pronunciados y sin ventilación ni aire acondicionado en el dormitorio principal, lo cual me ha provocado ataques de asma. A Casa é pequena mas prática, muito boa para um casal. O ar condicionado é essencial. A localização é muito boa, fica perto de tudo! O preço é razoável. Fomos bem recebidos pela Maribel, muito simpática. Os vizinhos falam muito e alto, ao entrar e sair de casa. Vamos voltar com certeza. By car you can visit any of the Pueblos Blancos, Conil, Vejer, El Palmar, Tarifa, Algeciras, etc ... less than an hour. 2ª Planta sin ascensor, no recomendado para personas con movilidad reducida. Rogamos no olviden cerrar con antelacion una hora con nosotros para poder planificar la jornada y evitar esperas. El día de su llegada, deben llamar por teléfono o whatsapp una vez en la ciudad para reconfirmar la hora y veros en la puerta del apartamento entre las 15.00h y las 21.00h. 2nd Floor without elevator. Not recomended for people with mobility limited. Don’t forget to confirm your arrival time few days in advance in order to plan the day and avoid waiting. On the day of your arrival, you must phone or whatsapp once in the city to confirm the time and meet you at the door of the apartment from 15:00 to 21:00.